Somehow, it came as no surprise to discover that he had been here – because I always thought of Charlie Chaplin as the one who carried a certain culture of the penniless, the ragged and the downtrodden from Europe across the Atlantic, translating it with such superlative success into an infinite capacity for hope, humour and resourcefulness in America. For centuries, Spitalfields has offered a refuge to the homeless and the dispossessed, so it makes sense that the most famous tramp of all time should have known this place. 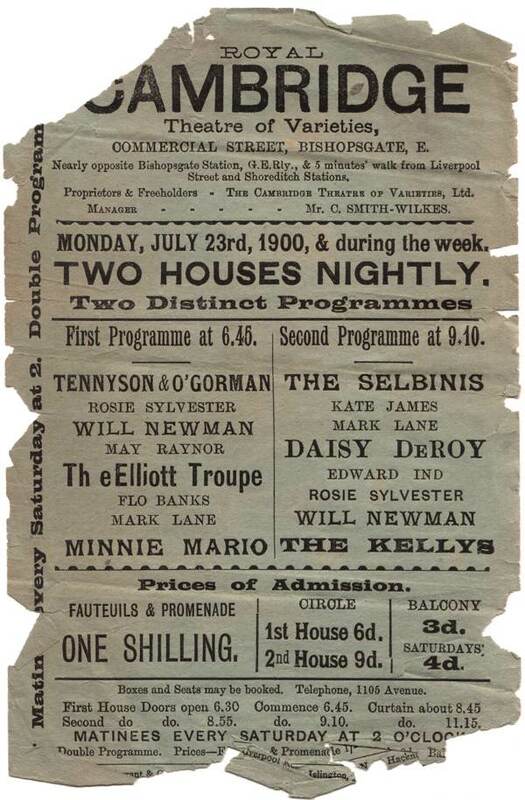 Last year, Vivian Betts who grew up in The Primrose in Bishopsgate gave me handful of playbills that had been in the pub as long as she remembered and which she took with her when they left in 1974 before the building was demolished. 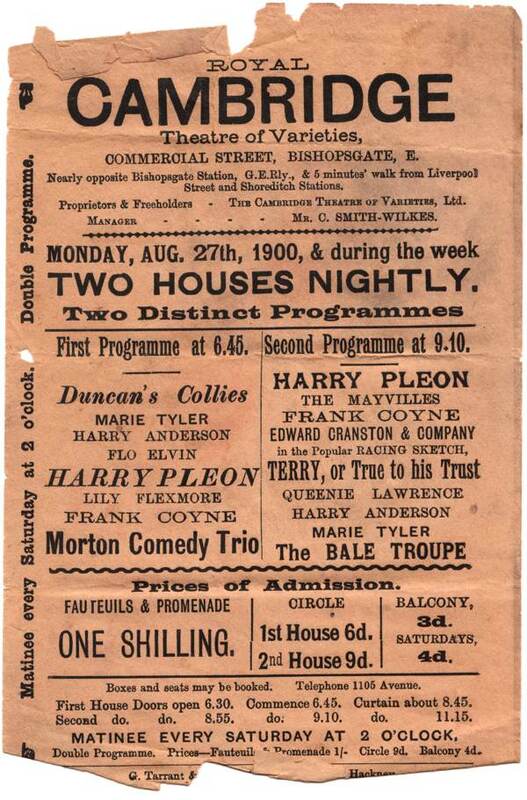 These bills were for the Royal Cambridge Theatre of Varieties in Commercial St. 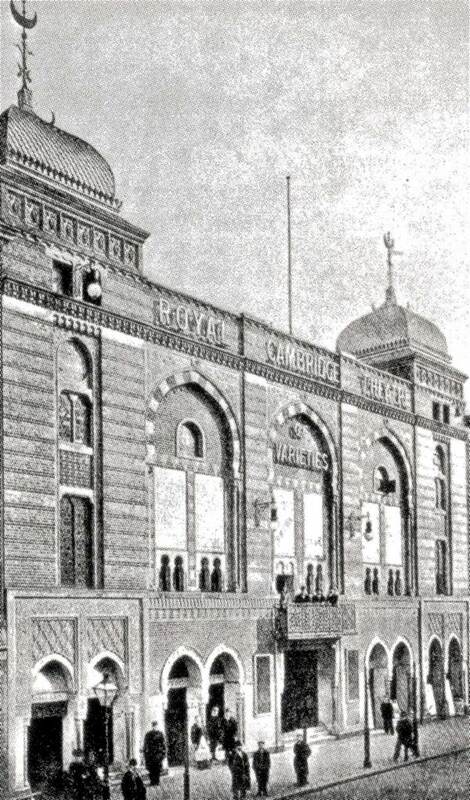 Opening in 1864, this vast two thousand seater theatre with a bar capacity of another thousand must have once presented a dramatic counterpoint to the church on the other side of the Spitalfields Market. Yet in the nineteenth century, it was one among many theatres in the immediate vicinity, in the days when the East End could match the West End for theatre and night life. 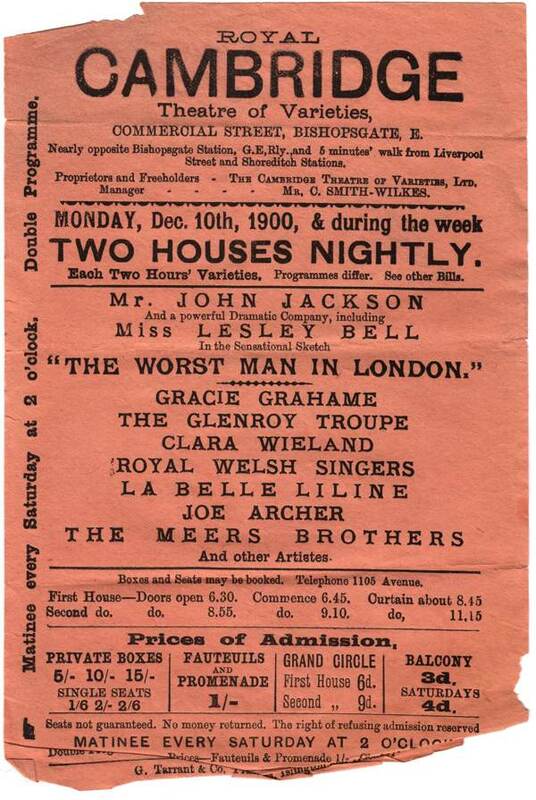 The ten-year-old Chaplin performed here as one of The Eight Lancashire Lads, a juvenile clog dance troupe, on Tuesday 24th October 1899 as part of the First Anniversary Benefit Performance, celebrating the reopening of the theatre a year earlier, after a fire that had destroyed it in 1896. Before he died, Chaplin’s alcoholic father signed up his son at the age of eight, in November 1898, with his friend William Jackson who managed The Eight Lancashire Lads, in return for the boy’s board and lodgings and a payment of half a crown a week to Chaplin’s mother Hannah. The engagement took Chaplin away from his pitiful London childhood and from his mother who had struggled to support him and his elder brother Sydney on her own, existing at the edge of mental illness while moving the family in and out of a succession of rented rooms until her younger son ended up in the workhouse at seven. 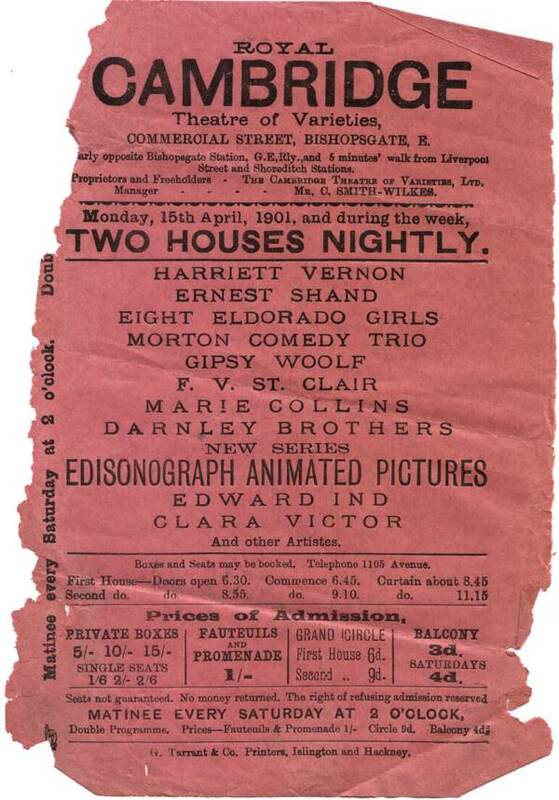 The handbills that Vivian Betts gave me for the Royal Cambridge Theatre of Varieties date from 1900 and, significantly, one contains the announcement of Edisonograph Animated Pictures as part of the programme, advertising the new medium in which Chaplin was to become pre-eminent and that would eventually eclipse Music Hall itself. 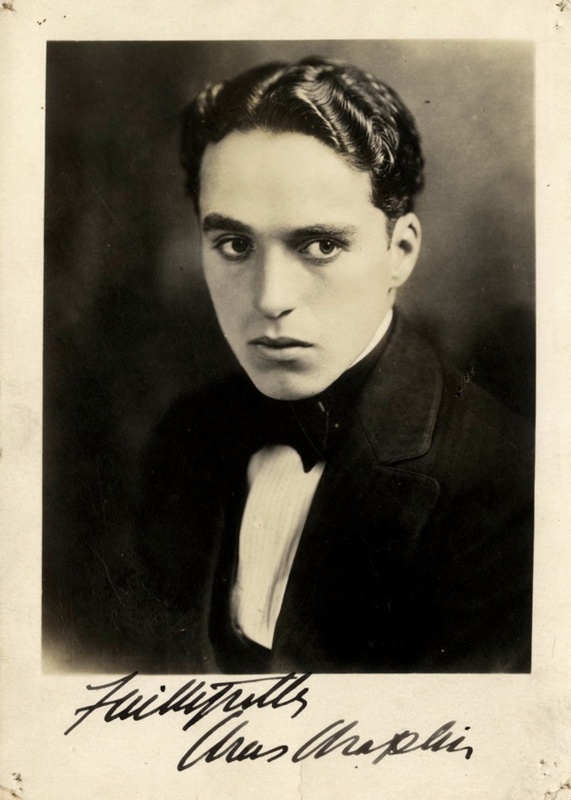 In 1908, Chaplin signed with Fred Karno’s comedy company in which he quickly became a rising star and, touring to America in 1913, he was talent spotted by the Keystone Film Studios and offered a contract at twenty-four years old for $150 a week. “What had happened? It seemed the world had suddenly changed, had taken me into its fond embrace and adopted me.” he wrote in astonishment and relief at his change of fortune in a life that had previously comprised only struggle. Now I shall always think of the ten-year-old Chaplin when I walk down Commercial St, on his way to the Cambridge Theatre of Varieties, pinching his sallow cheeks to make a show of good cheer and with his whole life in motion pictures awaiting him. At the northern end of Commercial St is the site of The Theatre, the first purpose-built theatre, where William Shakespeare performed and his early plays were staged. 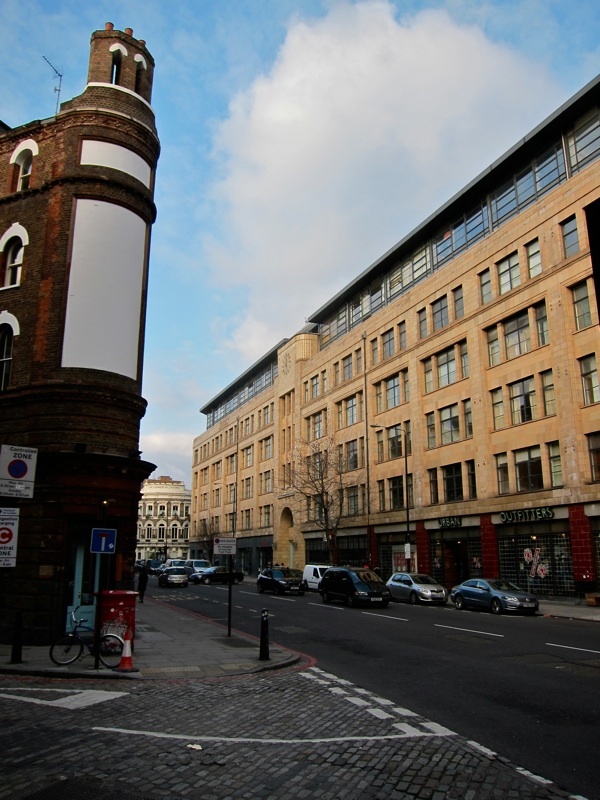 At the southern end of Commercial St is the site of the Goodman’s Fields Theatre, where David Garrick made his debut in Richard III and initiated the Shakespeare revival. And in middle was the Royal Cambridge Theatre of Varieties, where Charlie Chaplin played. Most that pass down it may be unaware, yet the line of Commercial St traces a major trajectory through our culture. 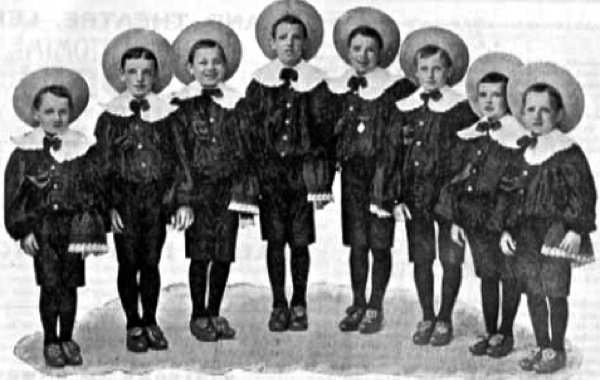 Charlie Chaplin performed with The Eight Yorkshire Lads at the Royal Cambridge Theatre of Varieties in Commercial St on Tuesday 24th October 1899. The extension of the Godfrey & Phillips cigarette factory replaced the demolished Royal Cambridge Theatre of Varieties in 1936. 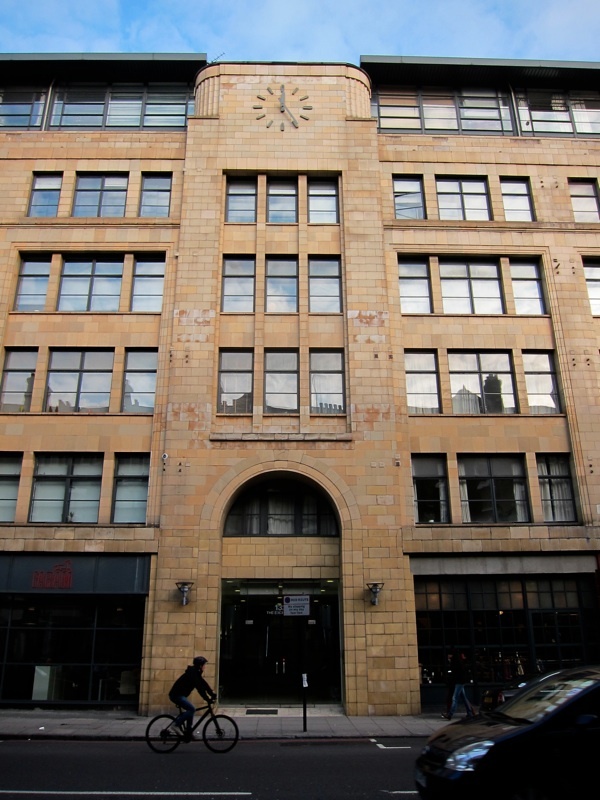 The entrance of the Godfrey & Phillips building echoes the entrance of the Royal Cambridge Theatre of Varieties. 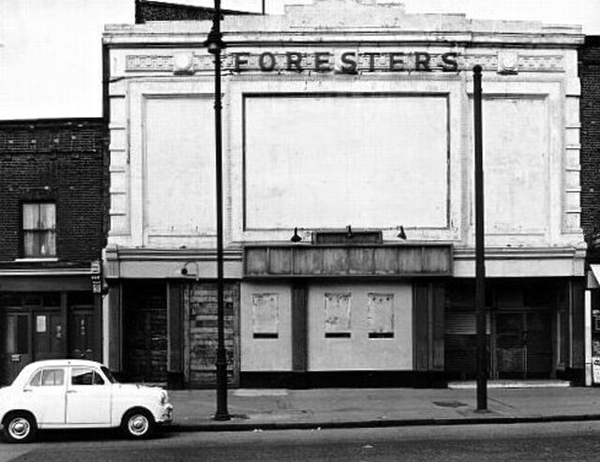 Foresters Music Hall, 95 Cambridge Heath Rd – where Charlie Chaplin gave his disastrous first solo comedy performance in 1907 – demolished in 1965. My grateful thanks to David Robinson, Chaplin’s biographer, for his assistance with this article. Interesting article. In the photos you show the Godfrey & Phillips cigarette factory on Commercial St, they made cigars and cigarettes including Abdulla Turkish cigarettes, Red & White and Black & White. My father worked there continually from when it opened in the 1930s till 1962 apart from his war service 1939 to 1945. He used to bring home rolls of scrap silver foil from the packets which I used to take to the Essoldo cinema on Bethnal Green Rd and usually won a free ticket for the next week by bringing the most foil.